The broad market needs to catch a bid to keep its uptrend intact. Stocks are see-sawing midday Thursday, following the worst stock selloff since February. The big S&P 500 Index shed 3.3% during the session, bringing the broad market index's losses to about 5.2% since the start of October. For the most part, market participants are taking the selling in stride this week - after February's sharp, volatile correction, October's selling seems pretty tame so far. But while the drop-off may feel less jarring, investors should be paying attention to what's happening here. While we're far from bear market territory at this point, we are closer to seeing this stock market rally derailed than many market participants realize. To figure out what's happening in the S&P 500 here, and how you should trade it, we're turning to the charts for a technical look. Big picture, uptrend in the S&P 500 is very much intact at this point - at least for now. While a super-short-term uptrend got busted on the way down Wednesday, that's less significant than the trend that connects lows set in February, April and May with Thursday's intraday lows. 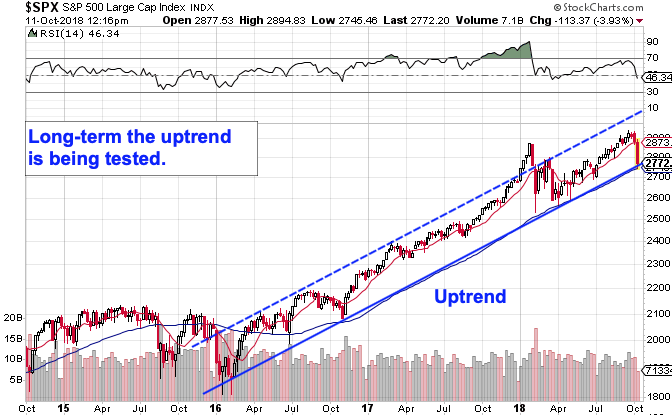 That uptrend support level has more or less followed the index's 200-day moving average all year long - that makes the 200-day a decent barometer for whether the uptrend is holding up in the intermediate-term. If the S&P materially violates the 200-day, then the uptrend is busted. While February's selloff was abrupt and deeper on an absolute basis, it also started at a point where the market was dramatically overbought. That isn't the case here, and as a result, from a momentum standpoint, the S&P 500 is already more oversold than it was back in February. 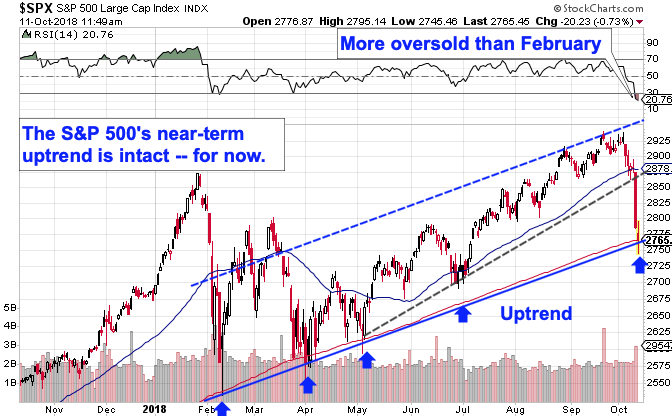 Ultimately, the market has corrected less severely than it did previously, but at the same time, it also has less room here to correct without violating its uptrend. The chart above shows weekly candles over the course of the last four years. For starters, it's clear that we're in a very similar position on the longer-term chart; the S&P 500 is testing its long-term uptrend for the seventh time in three years. That alone isn't a red flag - corrections in the context of an uptrend are a good thing, after all. But a violation of trendline support here would be a major cause for concern about this rally's staying power. At this point, it would take a material subsequent move lower for a sell signal to happen. But it's something that should be on investors' radar this fall.